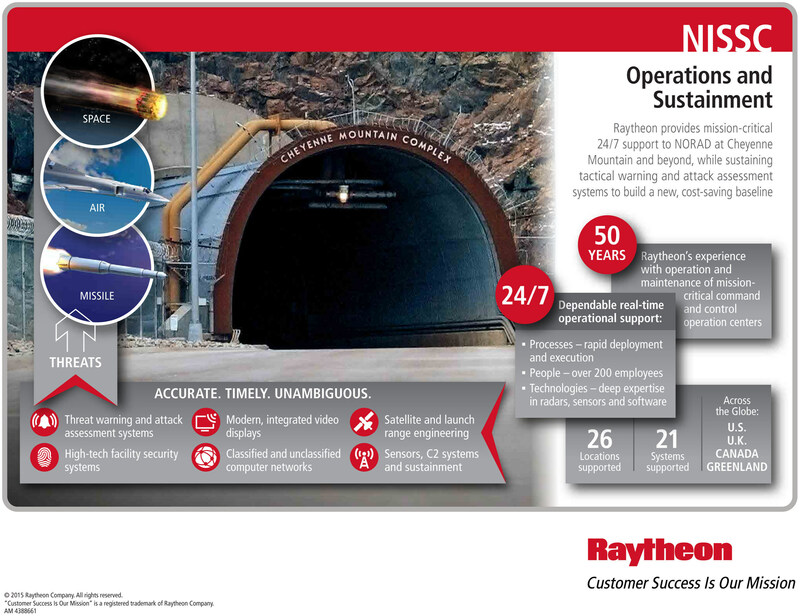 September 2, 2015 – Raytheon will speed up growth of its Colorado Springs presence after signing a $700 million multi-year indefinite-delivery/indefinite-quantity contract to support operations at NORAD’s Cheyenne Mountain Complex. Under the NORAD Integrated Space Support Contract (NISSC), Raytheon will provide 24/7 support to warning and attack assessment systems for air, missile and space threats. The contract was initially awarded to Raytheon in April 2015; however, protest activity delayed its execution. The Government Accountability Office denied the most recent protest on August 25. Raytheon has recently taken steps to ensure a successful transition of the contract, holding recruiting events in Colorado Springs and other locations and acquiring additional office space. The company plans to hire up to 700 employees in Colorado Springs by the end of 2016. Recruiting day events are planned for the coming weeks, and construction on new office space will be quickly completed. Last month, Raytheon announced a partnership with the Colorado Springs-based Space Foundation. The multi-year commitment will focus on science, technology, engineering and math (STEM) education programs. Raytheon will bring its MathAlive! exhibit to the Space Foundation’s Discovery Center in 2016.